Note: It may happen that the controller of your target device breaks down. The experience shows that this issue strongly depends on the hardware model you monitor. Please increase the scanning interval to discharge the controller and try again. Note: Sometimes the devices you monitor with this SSH SAN sensor return status values which are not officially documented so that the shown sensor status in PRTG differs from the "real" device status. For more information regarding this issue, please see the Knowledge Base: Knowledge Base: Why does my SSH SAN sensor show a wrong status? Note: After a firmware update of the target device, this sensor might show incorrect channel values. Please add this sensor type anew in this case. 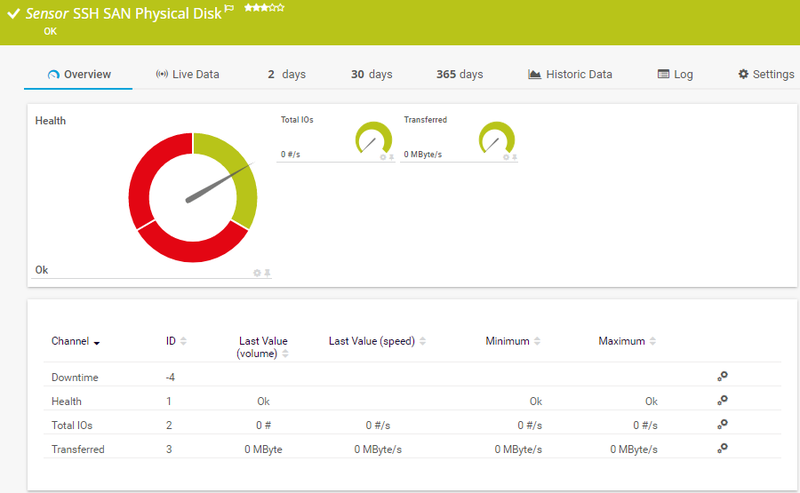 Select the disks on the SAN device you want to monitor. PRTG creates one sensor for each disk you choose in the Add Sensor dialog. The settings you choose in this dialog are valid for all of the sensors that are created.